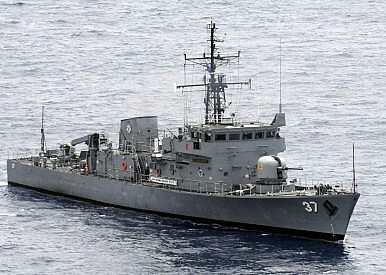 The Republic of the Philippines Navy patrol boat BRP Artemio Ricarte during the Balikatan exercises with the United States in 2009. Over the weekend, local media outlets reported that the Supreme Court of the Philippines may finally decide that a new U.S.-Philippine defense pact is constitutional more than a year after it was signed and before U.S. President Barack Obama touches down next week in Manila for an Asia-Pacific summit. The Enhanced Defense Cooperation Agreement (EDCA) – a pact inked in April 2014 between Washington and Manila that, among other things, would give U.S. troops and equipment wide access to Philippine military bases on a rotational basis – has been languishing in the face of a constitutional challenge in the Southeast Asian state. Though Philippine officials have been assuring outside observers that EDCA’s approval is a question of when rather than if, many in Washington had hoped a decision would be made before Obama attends the Asia-Pacific Economic Cooperation (APEC) meeting that Manila is hosting November 17-18. These sources also added that the tribunal would discuss and deliberate the draft decision on November 10 and that depending on whether or not there are objections, there could be a vote either then or on November 16 on the eve of the APEC summit. Separately, a government official also told Reuters that the administration expected a ruling in its favor before APEC. If true, this would be a significant development both for the Philippines as well as the U.S.-Philippine alliance. Resolving the constitutionality issues around EDCA would allow U.S. and Philippine defense officials to begin actually implementing arrangements – which range from the construction of facilities to the prepositioning of defense equipment – that they have long been talking about (See: “What’s Next for US-Philippine Military Ties?”). These steps are vital to giving the Philippines – still one of Asia’s weakest militaries – what defense planners call ‘minimum credible deterrence’ in the face of a variety of threats including China’s assertiveness in the South China Sea (See: “The Truth About Philippine Military Modernization and the China Threat). As I have noted before, time is not on Manila’s side (See: “A ‘New’ Philippine Naval Base in the South China Sea?”). Getting EDCA’s issues resolved before Obama’s visit would also no doubt inject some vigor into the bilateral relationship and ease U.S. anxieties about the pact. While some had expected a decision to only emerge by the end of the year ahead of presidential elections next May, an earlier clarification would be better. And even if most expect EDCA to eventually go through, legislative tests on U.S.-Philippine defense questions only conjure up nightmares of September 1991 when the Philippine Senate voted to end U.S. military presence in the country in a razor-thin 12-11 vote. But while this would be a welcome development for the Aquino and Obama administrations, there are still several lingering questions about the news. First, it is unclear whether a decision would definitively resolve all concerns by opponents of the pact, particularly the most contentious one that EDCA is a new treaty that requires Senate concurrence by a two-thirds majority, rather than an executive agreement in line with the 1951 Mutual Defense Treaty as the Aquino administration suggests. While several other reports are silent on these specifics, the Manila Times article does cite sources as saying that the decision states that Aquino has the authority to sign agreements as head of the executive branch. If this is indeed the court siding with the Aquino administration’s interpretation of EDCA as an executive agreement that does not require Senate concurrence, that would constitute a huge victory. As of now, it does not appear as if the Aquino administration has the necessary two-thirds majority in the Senate. Meanwhile, Senator Miriam Defensor Santiago, one of the chief opponents of EDCA, shows few signs of slowing her crusade against the pact. This week, she said she intends to sponsor a Senate resolution restating her view about the need for Senate concurrence. It is also unclear what exactly accounts for the alleged timing of the decision and the leaks about it. The Manila Times article offers little in this regard except an anonymous source contending that the Chief Justice may be trying to curry favor with the Aquino administration. Yet it is far from certain that an early decision before Obama’s arrival as well as news about it before hand would actually boost support for the pact rather than undermine it. Following the news and true to form, opponents of EDCA have already billed the timing of the decision as further proof that the Philippines is kowtowing to its ally by ‘gifting’ the agreement to Obama. Lastly, it is worth pointing out the obvious: that such disclosures – particularly in democracies like the Philippines – may not actually turn out to be much of anything. Consider the fact that Reuters, which had earlier reported on November 3 that a court source had said the ruling was unlikely before Obama’s visit, reported less than a week later that a ruling was likely before the trip. All this merely confirms that while the importance of EDCA to Philippine military modernization and the U.S.-Philippine alliance has always been clear to both administrations, how exactly Manila will get to the finish line continues to be much less so. Philippines to Revive Former US Naval Base Near South China Sea in 2016US Gives Philippines 114 Military Vehicles US, Philippines to Hold Amphibious Landing ExerciseWhat’s Next for US-Philippine Military Ties? What's Behind the New US-Philippines Drone Hype Under Duterte?